Have you been aboard Pride lately? Our Home Port of the Brave season continues in Baltimore this month as we celebrate Defenders’ Day at Fort McHenry National Monument and Historic Shrine. We’ll also feature a special privateers-related book talk. And we’ll be offering day sails and free deck tours at locations around Baltimore’s harbor all month. You won’t want to miss September with Pride of Baltimore II! 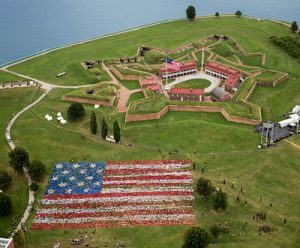 Join Pride of Baltimore II and Fort McHenry National Monument and Historic Shrine for a truly spectacular Defenders’ Day celebration! From Friday, September 11 through Sunday, September 13, 2015. Defenders’ Day is Baltimore’s oldest holiday. It honors the successful defense of the city from British attack and the writing of the National Anthem in 1814. It’s the biggest weekend of the year at Fort McHenry, and this year will be no exception. This three-day encampment and extravaganza will feature over 65 War of 1812 living historians, parades, military bands, a symbolic ship-to-shore bombardment and much more! Festivities include military drills, cooking demonstrations, musket drills, a dress parade and Star-Spangled Banner flag interactive activities, with the capstone event being a fireworks showcase on Saturday, September 12 at dusk. Pride will be docked at Fort McHenry beginning at 12 pm on Friday, September 11. We’ll offer free deck tours, day sails and a very special Fireworks Experience Saturday. Our Fireworks Experience offers you a special opportunity to see the fireworks from one of the best locations in the Inner Harbor – aboard our tall ship! You can enjoy the unique perspective of watching the fireworks from the water, and even bring your own food and beverages to enjoy (no glass containers). visit the Fort McHenry website. For more details on our Defenders’ Day Activities, visit our website. Due to popular demand, the sunset sail excursion of our privateers book talk has sold out! So we are offering a second sail before the lecture. See below for details. On Sunday, September 20, author David Head will lead a fascinating discussion about his new book, Privateers of the Americas (publish date: October, 2015). We all know about the critical role privateers played in America’s ‘Second War for Independence,’ but what happened to privateers after the War of 1812? In his new book, David Head examines raids on Spanish shipping conducted from the United States during the early 1800s – and how they influenced politics in South America. Among the available histories of privateering, there is no comparable work. Seafarers living in the United States secured commissions from Spanish American nations, attacked Spanish vessels, and returned to sell their captured cargoes from bases in Baltimore, New Orleans, and Galveston and on Amelia Island. Privateers sold millions of dollars of goods to untold numbers of ordinary Americans. Their collective enterprise involved more than a hundred vessels and thousands of people – not only ships’ crews but investors, merchants, suppliers, and others. They angered foreign diplomats, worried American officials, and muddied U.S. foreign relations. David Head will discuss how Spanish American privateering worked and who engaged in it; how the U.S. government responded; how privateers and their supporters evaded or exploited laws and international relations; what motivated men to choose this line of work; and ultimately, what it meant to them to sail for the new republics of Spanish America. His findings broaden our understanding of the experience of being an American in a wider world. Before and after the book talk, Pride will embark on a two-hour day sail from the Baltimore Marine Center at Lighthouse Point into the Patapsco River. She’ll pass Fort McHenry and sail near the Key Bridge, just like Francis Scott Key did during the War of 1812. With her sails unfurled, Pride is a sight to behold. Get your tickets now while you still can! Location: Pride of Baltimore Headquarters, 2700 Lighthouse Point East, Suite 330 Baltimore, MD 21224. Free street parking is available on Boston Street. A paid parking lot is available behind the gate, between 7-Eleven and the shop, Boston Street Running. The Day Sail is $60 for Privateer Society Members and $75 for non-members. The Member discount code for the day sail is GOSAILING. Register for the day sail here.The Privateers of the Americas book talk is $20 for non-members and $10 for Privateer Society Members. The Member discount code for book talk is PRIVATEER. Register for book talk here.The Sunset Sail is $60 for Privateer Society Members and $75 Non-Members. Register for sunset sail here. **SOLD OUT**This event is co-sponsored by the Maryland Historical Society Maritime Committee and Pride of Baltimore, Inc.
Heard about the National Aquarium’s Half-Price Friday Nights? Get access to the Aquarium’s award-winning exhibits for half the price of general admission during Half-Price Friday Nights, brought to you by M&T Bank. Half-Price Friday Nights runs year-round, allowing you to spend any (or every) Friday evening after 5 pm with the Aquarium’s 20,000-plus animal residents! And while you’re in town, come and see Pride – We’ll be offering FREE deck tours from our dock location at Pier 3, right next to the Aquarium, on Friday from 4 to 7:30 pm! A Deck Tour is the ultimate way to explore Pride of Baltimore II, learn about past and present life aboard schooner privateers, and interact with our passionate and knowledgeable crew. Tours are open to adults and children, and groups of all types. A Day Sail aboard Pride provides a unique opportunity to stand on her deck and imagine life as part of the crew in the 1800s. Guests can lend a hand to raise the sails as they learn about Baltimore’s rich maritime history. On Wednesday, October 7 from 7 to 9 pm, join us as we see authentic privateer documents and artifacts from the French and Indian War through the War of 1812 including an original Letter of Marque and sword from the privateer Viper. See documents proving American citizenship to try and stop British impressment on the high seas, a leading cause of the War of 1812. See a New England town’s auction for items taken by an American privateer from a British armed merchant ship. On display will be two small cannons; one of them is of a type and age (late 18th to early 19th century) that would have fit well on board the original “Pride of Baltimore”, Chasseur. Each has an interesting mystery that will be discussed. The evening concludes with a “history raffle” of several original newspapers. This lecture is presented by John Emond, a retired NASA program manager and collector of military antiques. To register, click here. Tickets are $5 members and $10 non-members. The discount code for members is ARTIFACT. Like Sail Mail? Share Us With a Friend! And they can sign up! The original Pride of Baltimore (1977-1986), pictured at right, was the first “reconstructed” Baltimore Clipper. It was designed by noted naval architect Thomas Gilmer based on historical documents of Chesapeake-based privateer schooners active in the War of 1812. The Pride of Baltimore II, constructed in 1988, is larger and has incorporated numerous changes based on experience with the original Pride. Email us your answer, and you could win a prize! Executive Director, Pride of Baltimore Inc.